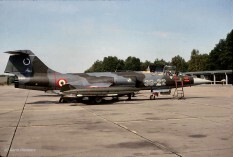 This month the German Air Force JG74 (1st Staffel), based at Neuburg, flying the F-4F Phantom, exchanged with the Italian Air Force 18 Gruppo based at Trapani-Birgi, flying the F-104S/ASA. It was a 2-way exchange. 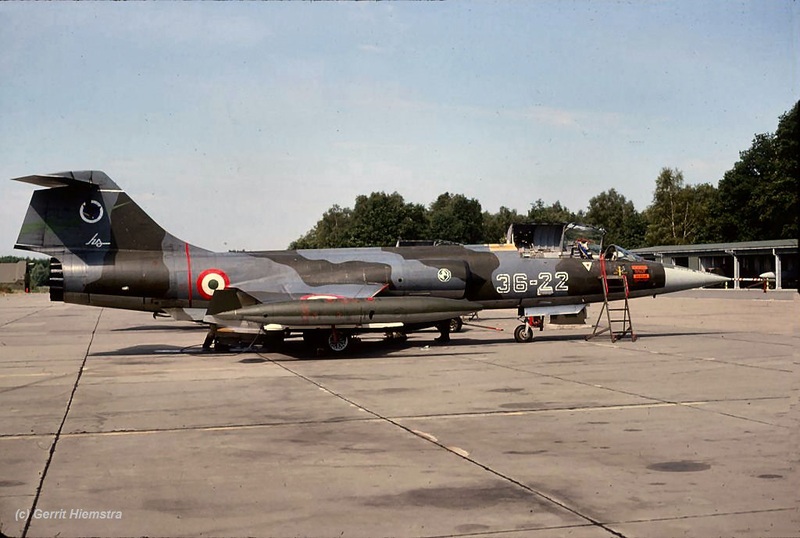 The four Italian Starfighters which flew to Neuburg were MM6909/37-23, MM6840/37-25, MM6921/37-27 and an unknown Starfighter with code "37-35". Since the code "37-35" was never used until the end of 18 Gruppo it is unlikely that this aircraft was available. We have feelings that only 3 aircraft flew to Neuburg and that 37-25 was mis-read once as 37-35. 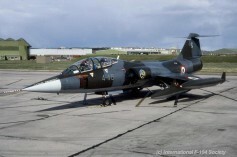 It is also possible that the fourth aircraft was MM6946/37-10 which was seen lateron (even in March 1990 at Deci) with JG74 squadron markings on the intake. The Germans also participated with 4 aircraft. Transport was arranged by Luftwaffe C-160 Transall and Italian Air Force C-130 Hercules aircraft. 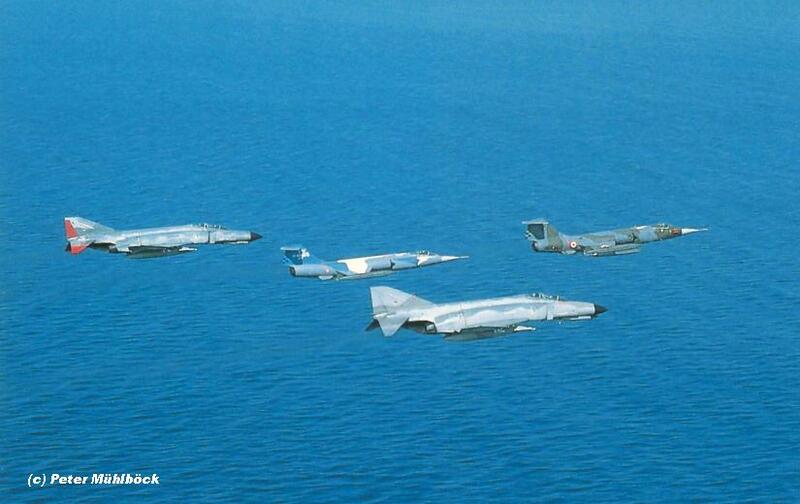 Photo beneath show a nice formation of JG74 Phantoms and 18 Gruppo Starfighters over the Mediterranean. (Photo Peter Mühlböck). This year the Danish Air Force 730 Eskadrille, flying the F-16A at Skrydstrup AB in Jutland, exchanged with the Italian Air Force 22 Gruppo based at Istrana, flying the F-104S/ASA. It was a 2-way squadron exchange. 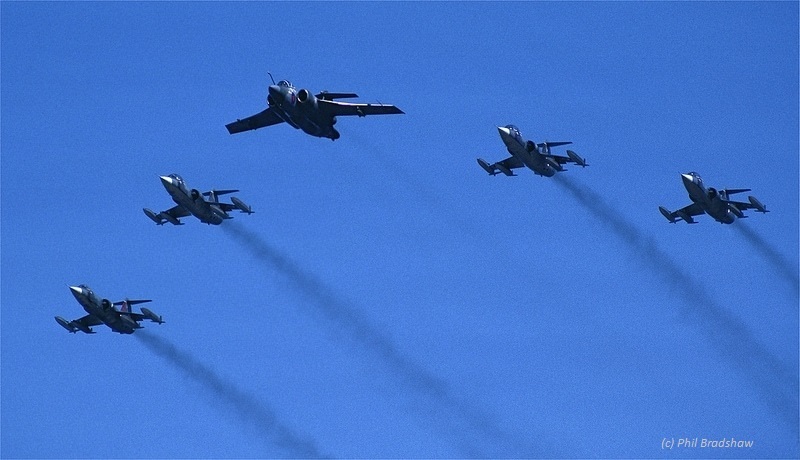 The Starfighters seen at Skrydstrup were : MM6869/51-01, MM6716/51-06, MM6717/51-15 and MM6736/51-22. This year the Royal Air Force 27 Squadron at Marham, flying the Tornado GR.1, exchanged with the Italian Air Force 28 gruppo based at Villafranca, flying the (R)F-104G. It was a 2-way squadron exchange. At least four Italian Starfighters flew to the UK being MM6545/3-32, MM6535/3-40, MM6563/3-43 and MM6631/3-47. 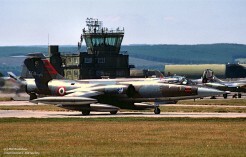 Pre-visit was on April 4th when two Starfighters flew to Marham being MM6535/3-40 and MM6631/3-47. 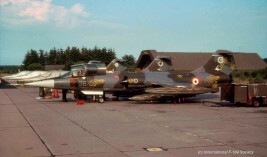 Beneath a photo showing RF-104G MM6631 code 3-47 taxying at Marham during the exchange. Due to unknown reasons the Tornado's were hosted within the 132 gruppo area at Villafranca Air Base. This month the Dutch Air Force 313 Squadron, based at Twenthe AB, flying the F-16A exchanged with the Italian Air Force 12 Gruppo based at Gioia del Colle, flying the F-104S and F-104S/ASA. It was a 2 way squadron exchange. Some Dutch as well as Italian aircraft got a lot of zapps prior their return home. Aircraft seen at Twenthe AB were MM6806/36-12 (S/ASA), MM6826/36-01 (S/ASA), MM6850/36-02 (S/ASA) and MM6875/36-22 (S). Transport was flown by C-130H MM61991/46-06 on 15 and 16 June. All Starfighters flew to Holland via Cameri AB where they landed June 6th. Aircraft MM6804/36-06 (S/ASA) and MM6806/36-12 (S/ASA) visited Twenthe AB on May 2nd for a pre-visit and returned back to Italy the day after. They used callsign "I 6804KR". Beneath some photos of participating Starfighters including aircraft 36-02 fully painted with zapps. I assume the Italians must have been upset by this kind of wild graffiti. 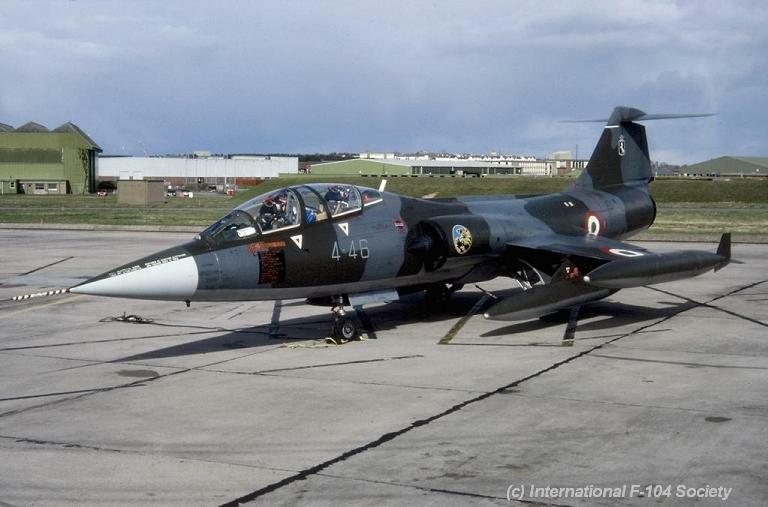 This year the Royal Air Force 237 OCU at Lossiemouth flying the Buccaneer S.2B exchanged with the Italian Air Force 20 Gruppo based at Grosseto, flying the TF-104G. It was a 2-way exchange. Seen in the UK were TF-104G MM54226/4-26, MM54251/4-34, MM54253/4-35 and MM54558/4-46. All aircraft returned via Lakenheath AB. 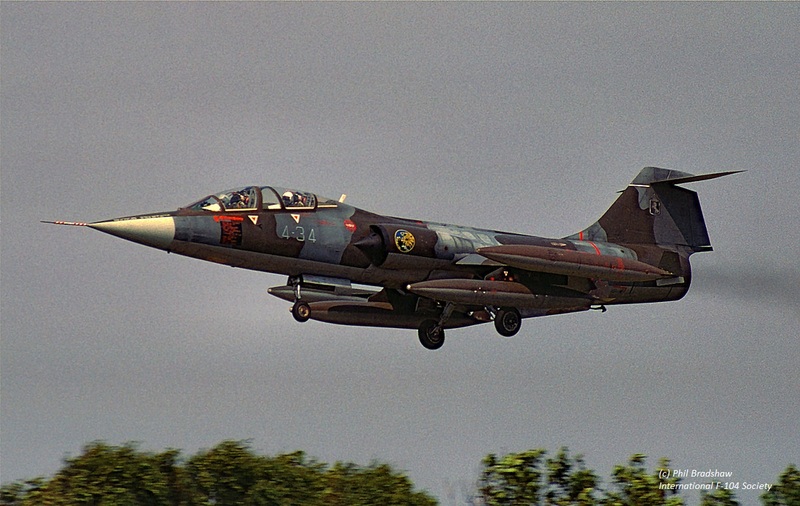 During this period also two Italian F-104G Starfighters flew their missions at Lossiemouth being MM6513/3-06 and MM6533/3-35. Soon after the exchange the Buccaneer XZ432 was seen with a Lion zapp! Photos beneath shows first MM54558 code 4-46 on the day of its departure back home. Phil Bradshaw provided photos showing MM54251 code 4-34 landing and MM6513 code 3-06 departing Lossiemouth + also a flypast on the 23rd of June. This year the Belgium Air Force 23 Smaldeel, based at Kleine Brogel, flying the F-16A, exchanged with the Italian Air Force 23 Gruppo based at Rimini, flying the F-104S/ASA. It was a 2-way squadron exchange. 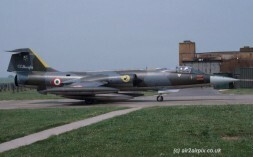 Four Italian Starfighters flew to Belgium : MM6740/5-32, MM6770/5-46, MM6776/5-37 and MM6778/5-44. 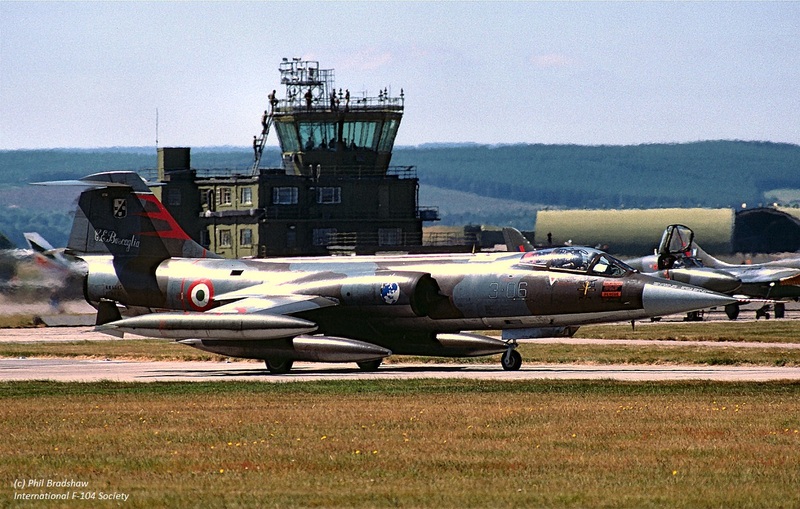 This year the Royal Air Force 208 Squadron at Lossiemouth, flying the Buccaneer S.2B, exchanged with the Italian Air Force 102 Gruppo based at Rimini, flying the F-104S/ASA. It was a 2-way squadron exchange. Starfighters which flew to the UK were: MM6886/5-02, MM6794/5-12, MM6821/5-16 and MM6833/5-11. Transport was flown by C-130H MM61998/46-12. Aircraft flew to the UK via Bitburg and aircraft MM6833 still had the blue 25 years anniversary special colorscheme. Pre-visit took place on 18 April when MM6796/5-15 (zapped with "XV") and MM6784/5-21 flew to the UK via Norvenich. This year the Royal Air Force 111 Squadron at Leuchars, flying the Phantom FG.1, exchanged with the Italian Air Force 9 Gruppo based at Grosseto, flying the F-104S. It was a one-way squadron exchange only. 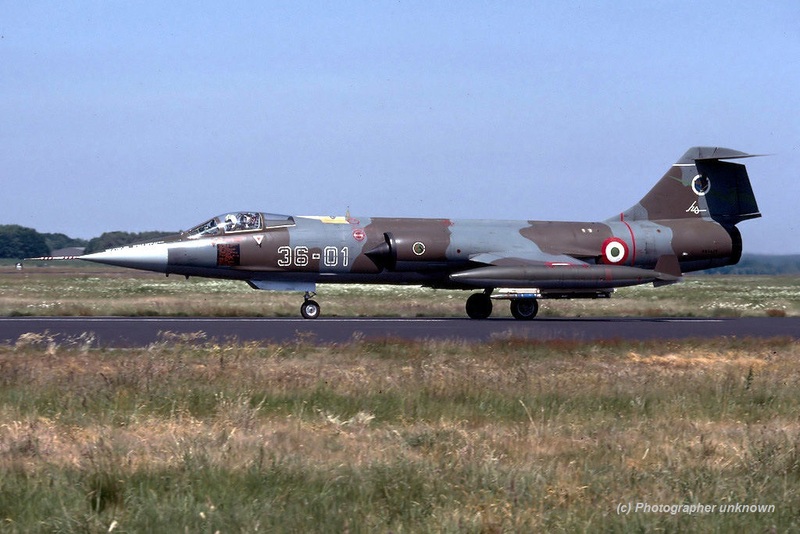 The Italian Starfighters only flew to the UK being: MM6800/4-1, MM6772/4-2, MM6827/4-5 and MM6808/4-10. They flew via Bitburg AB. Pre-visit was on 31 July when aircraft MM6763/4-11 and MM6800/4-1 and flew back to Grosseto via Norvenich on August 2nd and reaching Grosseto August 3rd. This year the German Navy MFG1 (2nd Staffel), based at Schleswig Jagel, flying the Tornado IDS, exchanged with the Italian Air Force 132 Gruppo based at Villafranca, flying the F-104G. It was a 2-way shifted squadron exchange. First the F-104s flew to Germany in August and later in September the German Tornados flew to Italy. The Starfighters at Schleswig were MM6558/3-02, MM6593/3-05, MM6514/3-10 and MM6567/3-16 which were all seen (confirmed) on August 22nd and 29th. Due to unknown reasons the Germans were hosted within the 28 gruppo area at Villafranca Air Base. (see attached sheet which is related to this situation). This year the Turkish Air Force 6 AJU, based at Bandirma AB, flying the F-104G exchanged with the Dutch Air Force 306 Squadron based at Volkel AB, flying the F-16A(R). It was a 1 way squadron exchange. Only the Dutch F-16s flew to Turkey. This year the Hellenic Air Force 116 Pterix, based at Araxos AB, flying the F-104G exchanged with the Italian Air Force 14 Gruppo flying the Fiat G-91R from Treviso Sant’Angelo. 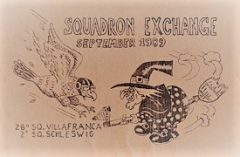 It was a 1-way squadron exchange. 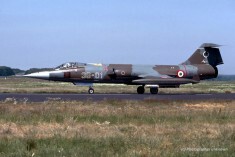 Only the Italian G-91R aircraft flew to Greece.